Jam Sebastian, the half of the YouTube sensation love team JaMich, had recently posted a photo of him smiling with his arms held high to show that he is still alive on the contrary to the circulating news that he had passed away. A few days ago, the news of Jam asking his family to consider mercy killing as he had seemed to have given up hope of recovery had started going around various social media. He even refused his chemotherapy which greatly concerned many fans. He said that he had been suffering too much and his family should just let him be. To this, his mother had told him that all his requests had been granted but to consider mercy killing is one thing she could never do. Many were saddened by such news and soon a hoax news of him passing away had started to circulate. To clear things up, Jam, on their love team’s official Facebook account, had posted his most recent photo which had been liked for over 290,000 times in just two days. Fans had expressed their concern and prayers for him. In the description, Jam had expressed his gratitude for those who had been concerned for him. He said that he wanted to let everybody knows that he is okay. Jam had started his 6th session of chemotherapy and after a month, he will be re-evaluated to know if his cancer cells had been eradicated, lessened or others. 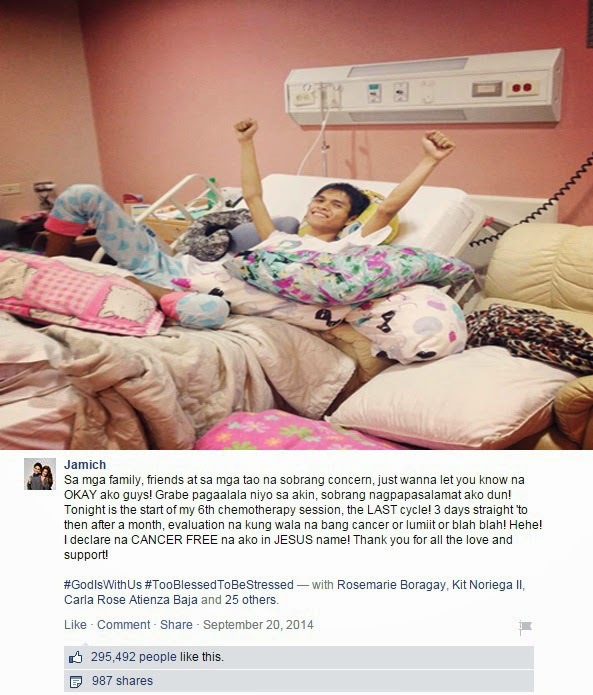 Even before the month is up, Jam had showed optimism by declaring himself as cancer free.